Everything becomes collectable, especially so when you have a large following of interest. Look at comics, baseball cards and more. The first issue of Superman comic printed in 1938/39 is worth $13,000 to $140,000 depending on condition. Find out what they are worth! 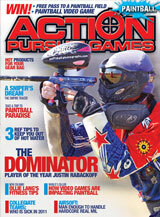 The purpose of this Web site is to enhance the support services we provide to our Paintball Collector's Guide. We've provided a number of resources here to help you report and find products, suggest items and learn about the collectable media involving paintball. The World Paintball Library™ was created out of a love for paintball. We realized that it was very important to share with the world, all of the cool and collectable paintball publications, DVD’s (We no longer add newer DVD's since everyone and their brother can make Paintball DVD), VHS, games and more. Most paintball people have an interest in collecting paintball memorabilia but don’t have a clue as to where to start. Now they do! Putting together a full Paintball Collector’s Guide™ is very expensive and time consuming. Because of the uniqueness of this guide, hardcopies will be priced at $29.95 . (Now Free by PDF download only) We want to make this information available to everyone as inexpensive as possible. With that in mind, you can become a library paint enthusiast and download the PDF of the Collector’s Guide. Many paintball publications have become very rare and valuable. We will be adding new material and will be updating collector prices fairly often. The Paintball Collectors Guide, PDF Edition 9 is now available FREE!!!!!. Now 61 pages of full color information. The Collector's Guide is now free! File is in Adobe PDF Format-If it does not download temporarily decrease your browser security. The World Paintball Library was founded and continues to be maintained by Pro Star Sports Inc. Best known through out paintball as the #1 source for paintball field operations training/startup and knowledge. Pro Star Sports maintains the Paintball Field Operators Guide, a 746 page training manual for those individuals and entrepreneurs looking to get into the paintball field business or better an existing operation. Visit the Pro Star Sports Inc. web site for more information on the guide and other books they publish. Take the easy path to starting your own collection. The Collector's Guide makes it easy. Explore the world with a cyber tour of paintball's media around the globe. Questions or problems regarding this web site should be directed to the webmaster: Pro Star Sports Inc. Copyright © 2011 Pro Star Sports Inc.. All rights reserved.